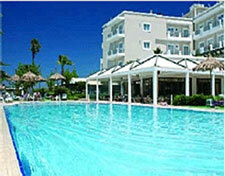 Kos Hotel was the first privately owned hotel on the island Kos. It has been open since 1967 offering a pleasant stay and a feeling of friendship to all of its guests Since 2003 we started a campaign in order to update and improve the facilities and service of the hotel. The main objective of the campaign is to successfully transform the hotel into a unique place, friendly, warm and hospitable, meeting the main guest requirement: feel at home. �Kos Junior Suites� is situated in a privileged location in the heart of the city, 10 meters from the beach, 20 minutes drive from the airport. It is open 12 months a year being the hot spot of the island�s centre contributing towards all around cultural events of the city. We offer independent, newly refurbished comfortable suites, gym and spa all year around as well as swimming pool, bar, lobby, reception and conference facilities. Special attention has been paid towards our new restaurant �Amvrosia�, where of Greek speciality �meze� selection and good local wine will win your satisfaction. After a Luculian feast have a drink at Nifalia The hospitality and people warmth along side our discretion will impress you and win your trust offering you a fine service. Our main priority is to offer you unforgetable holidays and to come back.